Loving fall is easy to do this year. Warm days, cool nights, regular rain -this is the climate we all want! I’m trying to soak up these days. Our late season crops feel the same way as they are looking great. Cabbage and broccoli, spinach and lettuce, it’s all exploding out there. Start slow cooker on low, add olive olive to coat bottom. Remove tomatillo husks, wash and halve. Lay chicken into cooker followed by onion slices then tomatillos, garlic and jalapeño. Pour in broth and finish with salt and pepper before closing the lid and cooking for 8 hours. Remove chicken and blend the contents of the cooker. Shred the chicken and top with blended sauce. Fennel -it’s not licorice really! Bring a large pot of water to a rolling boil, add a generous amount of salt and add kale. Blanch for 2 to 3 minutes, remove from the water with a deep fry skimmer or a slotted spoon and transfer to a bowl of cold water. Drain and, taking the greens up by the handful, squeeze hard to expel excess water. Chop medium-fine or cut in thin ribbons. Heat 2 tablespoons of the oil over medium heat in a large, heavy skillet and add onion. Cook, stirring often, until tender, about 5 minutes, and add fennel. Cook, stirring often, until the fennel begins to soften. Add salt to taste and continue to cook, stirring often, until the fennel is very tender and fragrant, about 8 minutes. Add garlic and kale, stir together for another minute, then stir in dill. Season to taste with salt and pepper, and remove from the heat. Heat oven to 375 degrees. Oil a 2-quart gratin or baking dish. Beat eggs in a large bowl. Whisk in milk and salt to taste (I use about 1/2 teaspoon). Stir in fennel and kale mixture, rice and Gruyère, and combine well. Taste and adjust seasonings. Scrape into baking dish. Sprinkle breadcrumbs over the top if using, and drizzle on the remaining tablespoon of oil. Bake 35 to 40 minutes, until set and the top and sides are beginning to color. Remove from oven and allow to sit for at least 10 minutes before serving. This is good hot, warm, or room temperature. Don’t want the fun to end in October? Sign up for our late fall share. Storage vegetables like carrots cabbage and potatoes along with fresh greens out of our tunnel. Sign up online here. We have filled almost all of our orders for pork. If you are considering filling your freezer with some outstanding farm raised bacon (and a few other cuts) don’t delay. Never had farm raised pork? It is like nothing the grocery store has to offer. Raised on pasture and fed organic grain (in addition to gelato) our pork tastes great and you know where the animals came from and how they lived. Ask us for a info/sign-up sheet at pick-up or download one here. Cold nights and some rain (finally) tells me that we are in a new season. To make this transition even clearer we are sending you home with both tomatoes and winter squash! Here’s a great rainy day recipe that puts both together into a dish that will keep you warm. It’s always a gamble to ask all of you to come out and toil with us on one of the biggest days off of the year…but we have never been disappointed! 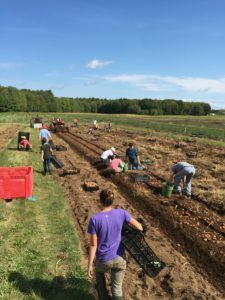 About 30 of us spent 2 hours pulling about 6ooo lbs of potatoes from a half acre of our fields. To have what would of been several days of work for the crew done in a morning was great. Thanks to all of you who came out and shared your day. Crisp air and clear skies…fall must be here. We have had several nights below 50 in the last week which is the true tipping point for our long-term summer crops. Once the nights drop below this magic number squash, tomatoes, peppers melons and the like stop growing until the sun warms them up each morning. If effect these heat loving crops go from a 24 hour growing period to one that is closer to 12 or less. 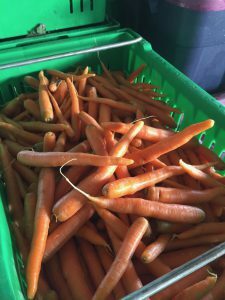 As you can imagine this means the days for these summer favorites are numbered but as luck would have it the hearty fall crops like carrots, cabbage, spinach and broccoli are going full steam, unfazed by the cool evenings. 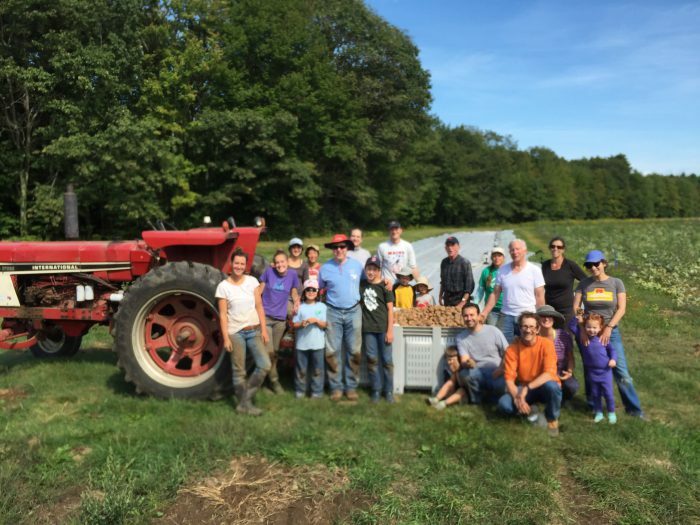 We finished the onion harvest this past week and got started on winter squash. Everyone’s favorite Delicata is looking good and will be making an early appearance in your shares very soon. Edamame is ready in the upic field. 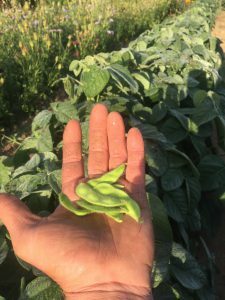 These furry soybean pods are great steamed and tossed in soy sauce or salt. Pop the soybeans out of the pod in your mouth and enjoy (don’t eat the pod! its way too chewy). Our Crystal Spring Farm Labor Day tradition returns this year! 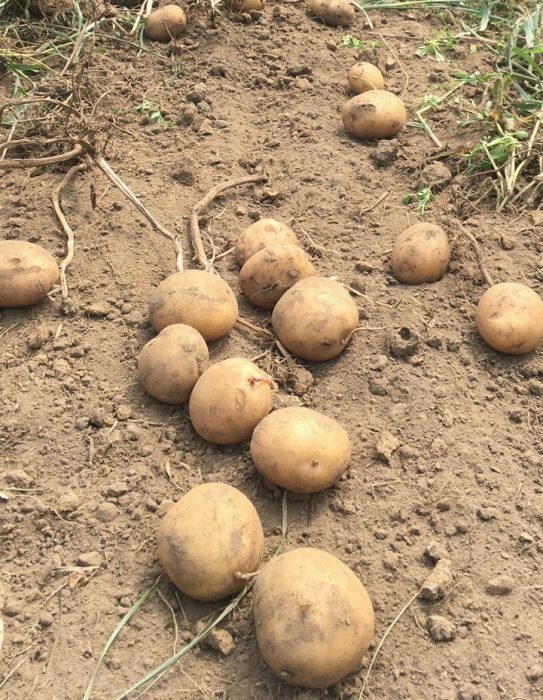 Join us on Labor Day (September 4) at 10 am to help harvest our potato crop. This is a great community event where we use our digging machine to lift the spuds and then you join us to help gather them up! Look for the trucks and tractors in the field on the North side on Pleasant Hill Road. Please join us! Orders are coming in for pork. If you are considering filling your freezer with some outstanding farm raised bacon (and a few other cuts) don’t delay. Never had farm raised pork it is like nothing the grocery store has to offer. Raised on pasture and fed organic grain (in addition to gelato) our pork tastes great and you know where the animals came from and how they lived. Ask us for a info/sign-up sheet at pick-up or download one here. Collective sign of relief on the farm with our first rainfall of more than a quarter-inch since early June. 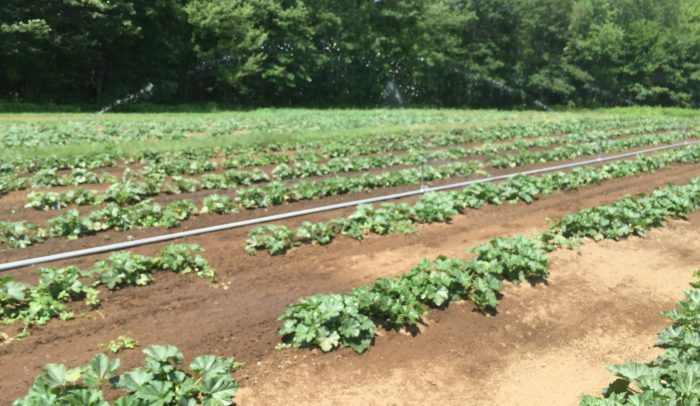 Farmers and produce alike brightened up and stood taller after almost two inches fell on Friday. 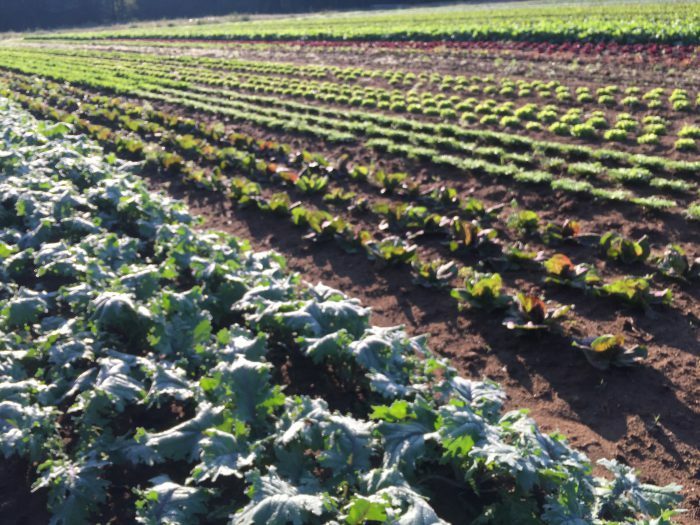 Look for fall crops to start coming in abundance soon. 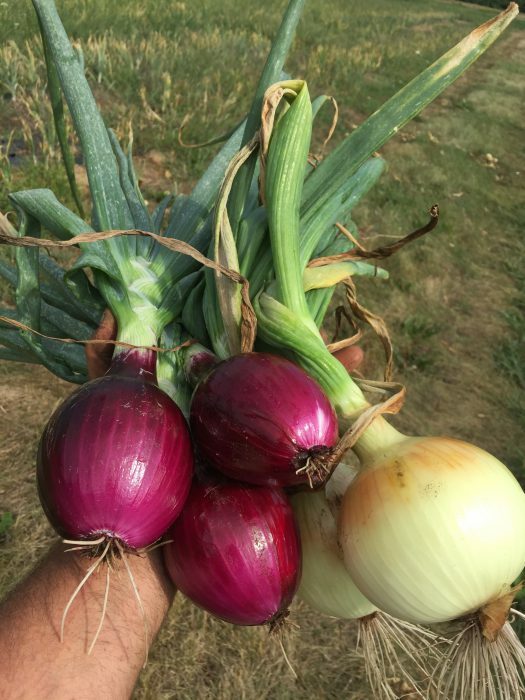 First of our storage onions are this week, no longer the sweet summer varieties, these are more pungent and cook down into sweet savory flavor better. Greens are also coming back with lettuce and chard coming back onto the scene. Our favorite Crystal Spring Farm tradition returns this year! 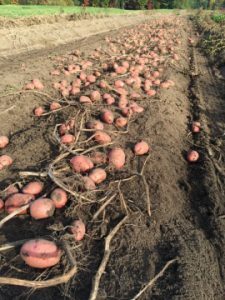 Join us on Labor Day (September 4) to help harvest our potato crop. This is a great community event where we use our digging machine to lift the spuds and then you join us to help us gather them up! We start at 10am in the fields. Please join us! 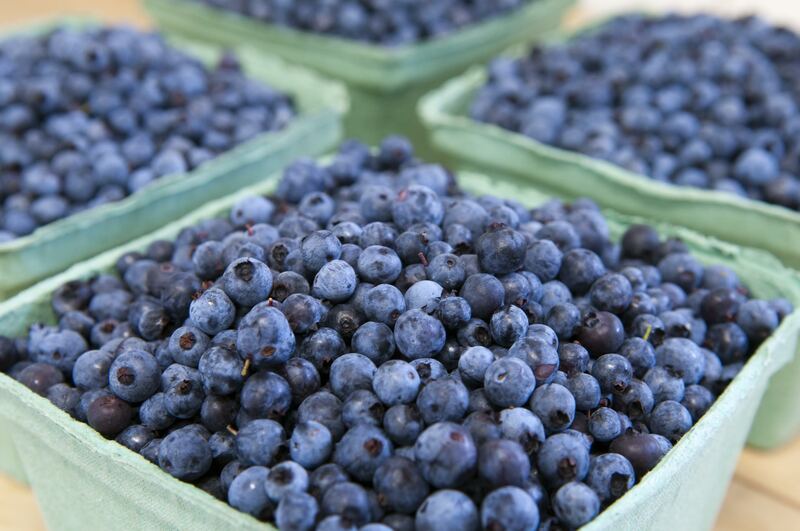 Order organic Maine wild blueberries for this Friday! Quarts are $9 and will be delivered for Fridays pickup. Order online here. **Please note we are not able to take orders via phone or email as in years past. We will star taking orders for whole and half pigs this week. If you have never had farm raised pork it is like nothing the grocery store has to offer. Raised on pasture and fed organic grain (in addition to gelato) our pork tastes great and you know where the animals came from and how they lived. Ask us for a info/sign-up sheet at pick-up or download one here. More deep summer vegetables this week with basil, tomatoes and Italian summer onions leading the lineup. Some great simple meals can come together here by adding a sharp knife and some olive oil. 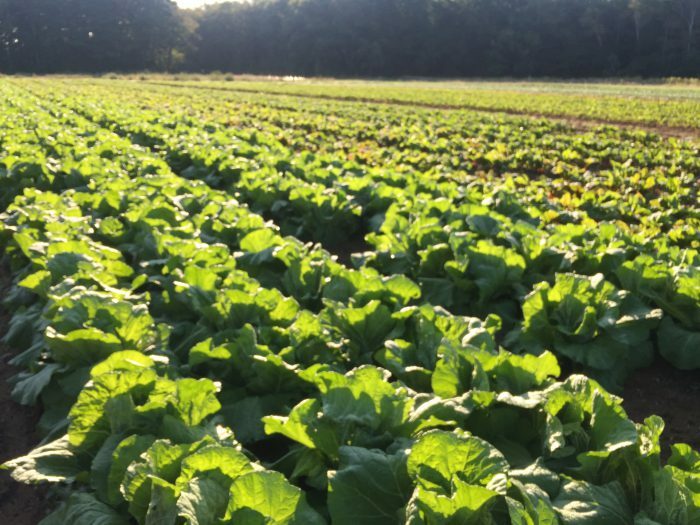 We have many lovely greens in the field; lettuce, chard and the like, but they are not quite harvestable this week. With hope and luck we are looking to some measurable rain as the week wears on into the weekend. 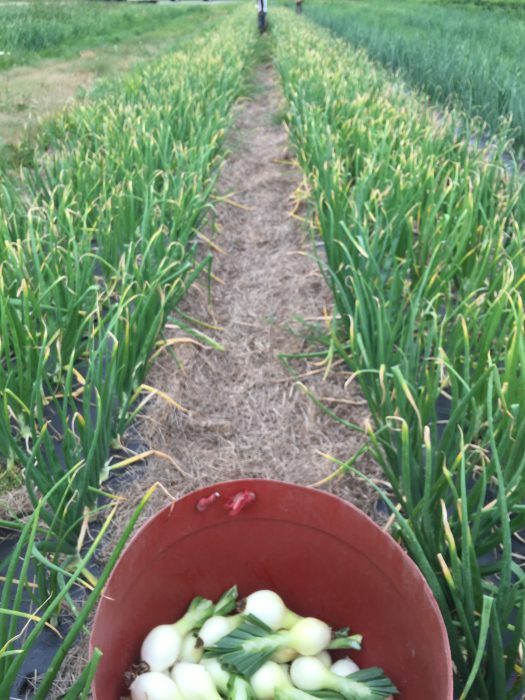 Harvest of our first fall crops has also begun as we have started to pull rows and rows of onions out of the fields and into the greenhouse to dry down and cure. 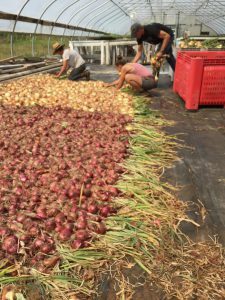 This is one of my favorite farm tasks both because of the shear volume of onions we gather but also the process of setting them out in honeycomb patterns on the floor of our propagation house. Over the next weeks the stems and leaves will wither and seal off the onion making it hardy and storable. We have been teased with these little rain events over the past week. While these spritzes have helped in the short term we are still in dire need of a soaking, multi-inch precipitation event. We will have a lapse in our supply of salad greens due to this dryness as we had trouble getting lettuce to germinate. Luckily we will have lots of good summer produce to distant you with in the meantime. The farm has been steaming ahead this past week under the able hands of the farm crew while I have been busy full-time raking blueberries. 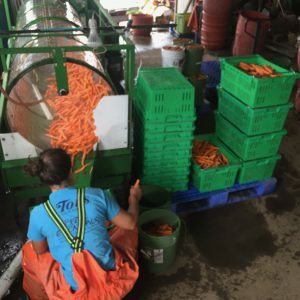 In addition to growing food here we also train farmers, and the crew we have this year is a solid lot. It is a great luxury for me to be able to focus on the flow of blueberries over the rakes and trust that the flow of harvest, seeding, weeding and the like are in such able hands! We pulled a few potatoes this week for the share. These Yukon Gems are a new variety for us…hope you like them. Similar to a Yukon Gold, best for roasting but can be used how you like best. August is here and it is hot. We have been running our irrigation well without stop for the last 11 days (literally). Rain dance, spells, cloud seeding; its all welcome — please! On the vegetable side we are just starting to pick tomatoes (yippee!) look for them to be in abundance soon. Along with other summer faves like eggplants peppers and more of these lovely summer onions. Still Have Kohlrabi in Your Fridge? 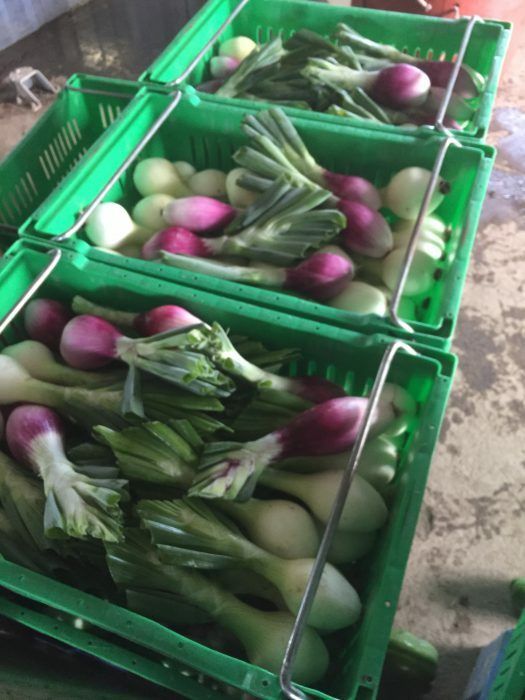 We will not have kohlrabi in the share this week, but there was a fair amount of chatter at pick up last week about great recipes people have tried with kohlrabi, or on the other end, a build up of kohlrabi in the fridge. If you are in the latter category, here’s a couple recipes that we like. If you just want to wing it try using kohlrabi any way you would a carrots (slice, shred, saute). We’ve been grating it and topping our salads with it for nice crunch. Others have been slicing and baking or roasting them “french fry” style (with curry powder! ), using kohlrabi in carrot soup, and making latkes with kohlrabi. Hope these ideas help. If you are ever feeling overwhelmed, or looking for ideas to use any of the produce, please let us know! We’re happy to share ideas. Julienne (cut into matchsticks) carrots and kohlrabi and toss together with the rest of the ingredients. Let sit for 15 minutes and enjoy. Grate Kohlrabi with food processor or box grater. Lay into a kitchen towel and squeeze out any excess moisture. Preheat large skillet over medium heat and add enough olive to cover entire surface. Toss kohlrabi with the rest of the ingredients. Once oil is hot enough to shimmer in the skillet and heaping tablespoon size portion of kohlrabi mixture into the oil, using a spatula to lightly flatten. Cook until starting to brown and then flip. Continue to cook until lightly brown on the other side. remove to a towel and continue cooking spoonfuls until you have finished the batter. Enjoy with yogurt, soy sauce or your favorite sauce. As July comes to a close and we have our first rain in almost a month (last one was but .22 inches) it’s time for the onion family to shine. Alliums are one of the first crops we start in the greenhouse (last week of February) and once they germinate their leaves start measuring the light they gather. 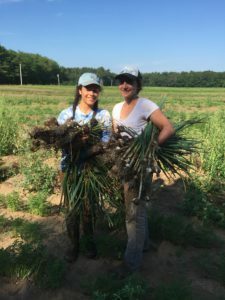 Unlike leafy crops (lettuce or kale) or even most fruit crops (zucchini) that are ready for harvest after they gather a set number of light and heat hours, alliums will continue to grow until the hours of daylight stops lengthening at summer solstice. Once the days start shortening the plants take notice and put all of their energy into making a bulb. This bulb is the onion’s attempt to store energy for the coming winter and kickstart the production of flowers and seeds next spring. Of course we don’t let this happen because we enjoy the eating these bulb so much. 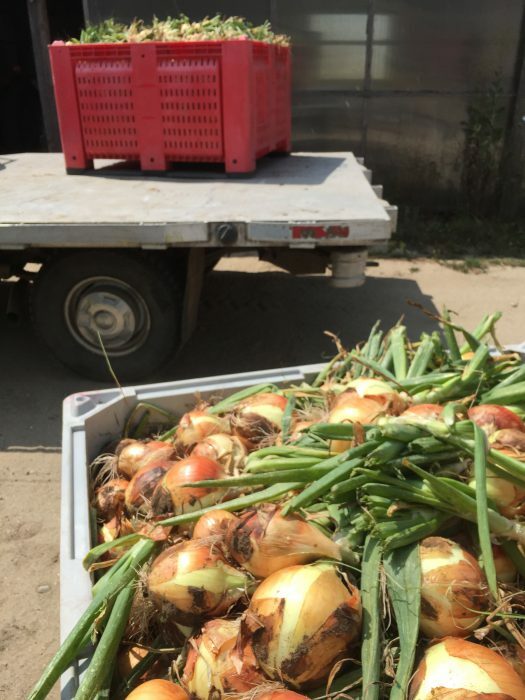 We are harvesting our first sweet onions this week for Brunswick (delivered shares will see them next week). Sweet onions are available for just a short time as they don’t store well. This is the onion to chop raw into a salad or cut thickly to top your best grilled burger. Of course you can cook them but they really shine raw. 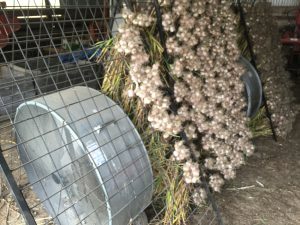 We also harvested garlic this week which is currently drying and curing in the barn. If you are on the way out to the Upic field you can check out out fan assisted drying contraption! We should start seeing garlic in the share in about a month. Need flowers for an event, dinner party or just to celebrate the week? 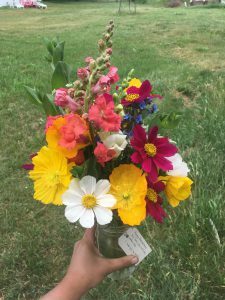 Send us an email (info@crystalspringcsa.com) with the subject flowers and we can put together large or small arrangements with just a couple days notice. Been adding irrigation to our todo list this week. Unfortunately this is not a small task and has been eating up a large chunk of everyday as we move our water delivery from plot to plot and field to field. Most of our watering is done with the help of 30 foot aluminum pipes we connect together in crazy configurations going up hills, around corners and under roads. We lay this pipe out each spring and in between those April days and now the mice move in. They stuff the ends with their favorite grasses and seeds, hoping these shiny metal houses will become the rodent equivalent of modern dream homes come winter. As we move the pipes and place them about the mice vacate, leaving behind all of their hard work. This means we have to flush these clogs from each 30 foot section as we link them so that their winter stores won’t clog the sprinkler heads or drip lines. Watching the matted lumps of golden hay pour forth like the drain clearing in that old Drain-o commercial with the see through kitchen sink. I think a lot about these mice and all of their hard work as I am waiting for clean the water every 30 feet. I’m glad I am not a field mouse, but I respect their labors. 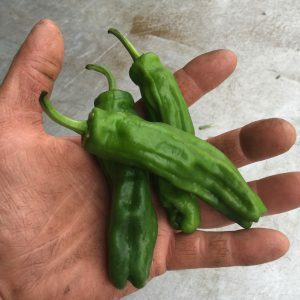 A new addition to the harvest list this year is the venerable shishito pepper. This is a thin walled frying pepper that lends itself to a quick blistering in a hot pan or the grill. Here’s our favorite way to enjoy them…..
1 teaspoon olive or sesame oil add to a small skillet. Heat under medium/high heat until oil shimmers and is almost smoking. Add peppers and turn every minute or two until the skin turns brown and blisters where the touch the pan. Don’t be shy with the salt (corse kosher or sea salt is great here) and enjoy immediately. 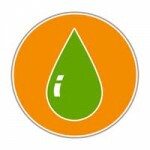 For those that want more we have about twenty plants in Upic…. This second week of July is what we like to call balance week. Imagine a playground seesaw or teeter totter with the months of April, May and June on one side and August, September and October on the other. The early months are all planting and care; filling up acres and acres of ground with seeds and transplants. The later months are all harvest of those crops with little time for anything else. This week we are sitting in the middle of July, balanced on the fulcrum and about to push off into the heavy lifting part of the year. I really enjoy these couple weeks. They are my last chance to repair some broken things, finish a project or two and just take stock of the season so far. This year we have a great crew. Everyone is trained and gung-ho for the months ahead. My only desire at this point is for a good soaking rain. Not too much to ask for right? Like an old friend carrots are back this week. This first week’s harvest are small and sweet as we begin work our way through a quarter acre that was sown back on April 12. 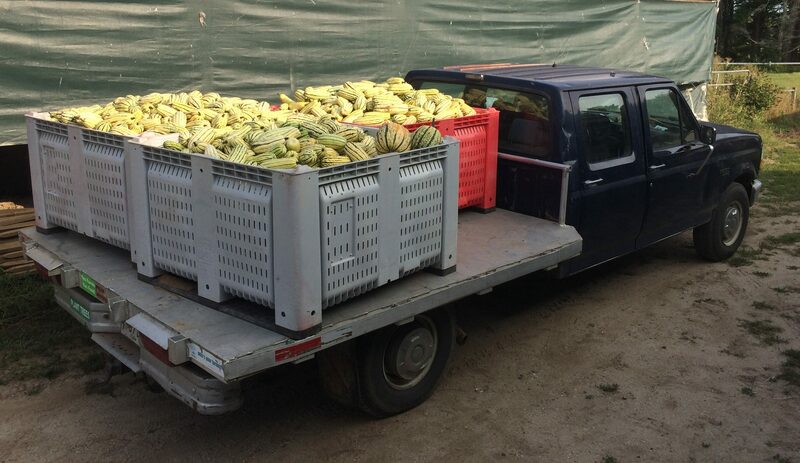 We hope to have a steady supply of our favorite crop through the fall.